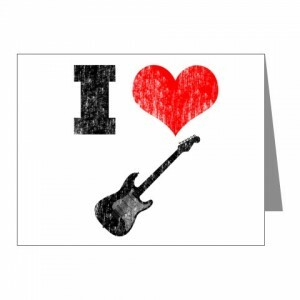 Here at Learn & Master, we've dubbed February as "Love Your Guitar Month"! After all, it is the month of romance. We've traditionally directed all our romantic feelings toward that special guy or gal. However, there's another 'gal' in your life that needs love and attention too. That's right - your guitar! She is needy, particular and oh so rewarding...but only if treated right. Greg also joined us for our Tuesday Night Live Lessons last week to share more tips and answer questions from our students about guitar care. You can watch that, and all other Live Lessons on our USTREAM page: Click Here to watch. Join us weekly at Live Lessons for more great guitar lessons. Keep it in tune! A tuned guitar is a happy guitar. Change the strings. We always try to get every little bit out of those strings and forfeit better tone. Clean and polish the body and neck. We recommend Professor Green's guitar polish. There aren't any harmful chemicals in these polishes. Get our Setup and Maintenance course so you can do your own guitar care! I give you the same challenge. 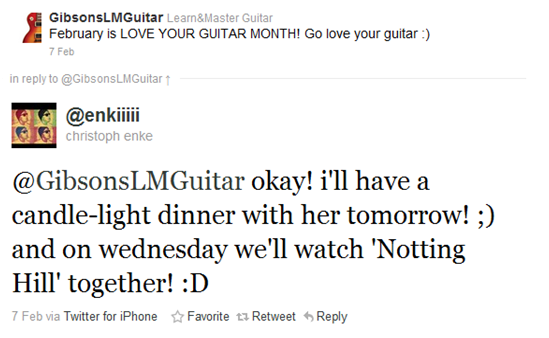 What will you do to Love Your Guitar this month? Let us know and GO LOVE YOUR GUITAR!